By BENCHMARK U S A. EXCLUSIVE WALL, CORNER or ANYWHERE PLACEMENT DESIGN. TWO & 1/2 FEET HIGH (30 INCHES). USES HOT OIL & POPCORN or POPCORN PORTION PACK'S (PopCorn, Salt & Oil Combo Packs). NOTE: The Optional Pedestal/Base unit is NOT included with the Popper in this particular listing! POPPING KETTLE - The inner kettle is constructed of thick gauge anodized aluminum for maximum performance and easy cleaning. Aluminum provides the best heat transfer of any cookware approved alloy, while the 20 mil thick anodizing armors the kettle for durability and provides a super-slick surface for easy cleaning. SILVER - 2 DIMENSIONAL " POPCORN " SIGN. OLD MAID DRAWER for Catching Unpopped Kernels. HEATED POPCORN DECK - Keeps Popcorn Warm & Fresh! EASY ACCESS DOORS ON FRONT. MAKES 127 QUARTS PER HOUR (Volume) of POPCORN. POPPER DIMENSIONS & WEIGHT: 20" W X 15" D X 30 HIGH. ELECTRICAL SPECS: 120 VOLT / 1180 WATTS / 9.9 AMPS. 15 AMP PLUG (NEMA 5-15P) PLUGS INTO ANY STANDARD 110V 3-Prong Grounded ELECTRICAL OUTLET. All Poppers ETL Tested to the following Standards: UL 197 (9th Edition), NSF 4, and CSA C22.2 NO 109 (M1981). These high quality poppers have been engineered to provide years of service under even the most demanding of conditions. The user-friendly design of these poppers allows for in-field repairs to be made easily with standard household tools. THE Matching Pedestal Base for this popper as pictured here for display purposes only, but it is NOT INCLUDED in this Listing. THE POPCORN SHOP For absolutely any Item you may want or need for Popping Corn, including Supplies to use with any Popcorn Machine! By the art deco architecture of the late 1920s and 1930s, these popcorn machines are ideal for home theaters. Its unique design enables it to be placed against a wall for a minimal space requirement while still providing an attractive visual impact. Ordinary popcorn machines have the graphics and cosmetic appeal on the other side of the popper making them unsuitable for wall placement. This Commercial Quality Popcorn Machine not only Delivers Delicious Movie Theater Popcorn, but put's on it's own Show as you & your Guest's or Customers Watch the Kernels Pop, Hear that Unmistakable Sound and Smell that Wonderful Aroma that draws everyone to it! This Excellent Product Becomes the Main Attraction in any environment, including your Home Theater or Retail Shop. We DO NOT accept any Personal Bank Checks. If you have one of these unacceptable addresses above. We will be happy to work with you, but please do so before 5 Days. ALSO> you probably need a Popper that works with 220-240 Volt Electrical systems. Although we will help you with this any way we can. NOTE: No Overseas or International Sale includes any Free Labor. PLEASE CHECK OUT OUR other items. For Future Supplies or reference! Picture with Pedestal/Stand Depicts the Popper for sale in this listing on it's Matching Pedestal Base, but the Base is NOT INCLUDED in this Listing. The optional Pedestal Base (19 w x 14" d x 32 h) provides storage for all of your popcorn supplies while placing the popper at the ideal operating height, not to mention providing it's own Theater Quality "Popcorn Sign Graphics. The item "BRAND NEW METROPOLITAN BLACK 6 OZ. 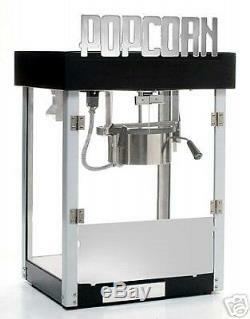 POPCORN POPPER MACHINE by BENCHMARK USA" is in sale since Monday, January 4, 2010. This item is in the category "Business & Industrial\Restaurant & Food Service\Vending & Tabletop Concessions\Tabletop Concession Machines\Popcorn". The seller is "jgbachman" and is located in Greenville, South Carolina.